If you believe the accreditation process can be better . . . if you are interested in philanthropic partnerships . . . if you are looking for new strategies for success in an ever-changing healthcare environment .. . then join us at OOSS Perspective 2017@ASCRS/ASOA Los Angeles. We’ll begin with a full-course buffet luncheon with friends, colleagues, and industry leaders, followed by Mike Romansky’s annual Washington Update and a progress report on OOSS 2020 Initiatives. 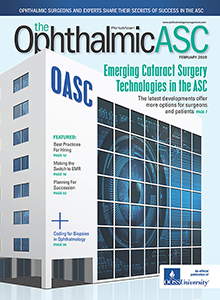 We’ll introduce an innovative pilot program to develop a model accreditation process tailored specifically for the ophthalmic ASC in collaboration with the Institute for Medical Quality (IMQ), a CMS-approved accrediting organization for ambulatory surgery centers. And our keynote feature will explore the work of ASCs to address the needs of their communities, including participation in the high-impact program Operation Sight—an OOSSGives partnership in the making. If you’re looking for answers, then CLICK HERE to learn more and RSVP for OOSS Perspective 2017.